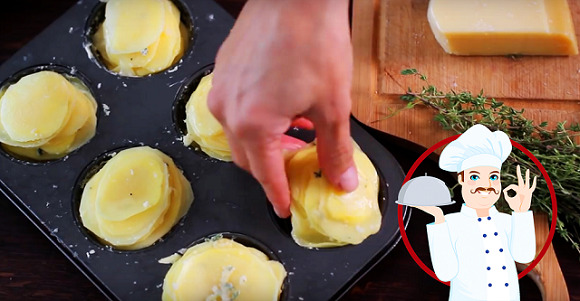 Home Cooking Adventure shows us how to use the bakeware for cooking up something other than traditional muffins. This easy recipe for Parmesan potato stacks makes a great side dish or appetizer that your family and guests will definitely enjoy. They are very flavorful due to the thyme, garlic and parmesan. If you don't like thyme, you can use any other herbs you prefer like rosemary, oregano or basil. Find here below the list of ingredients and instructions on how to prepare them. Preheat the oven to 375°F (190C). Butter 12 muffin cups and set aside. Cut the potatoes into thin slices, preferably using a mandoline slicer. These potatoes will be crusty on the outside, tender and delicious on the inside. They're great on their own or as a side with steak, chicken and basically anything, so try them!